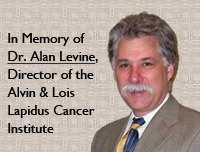 The Alvin & Lois Lapidus Cancer Institute offers the most advanced diagnosis and treatment for a wide range of cancers. Sinai and Northwest hospitals' vision of multidisciplinary oncology care places the patient and family at the center of a coordinated set of services and specialists who work on behalf of the patient. The Alvin & Lois Lapidus Cancer Institute offers one of the region's most sophisticated array of services for cancer patients. Our physician specialists participate actively in clinical research studies, providing patients with the most advanced treatment modalities available. Working together as a multidisciplinary team, our specialists offer a wide variety of treatment options and supportive care in pain management and survivorship. Across disciplines, we have built the Alvin & Lois Lapidus Cancer Institute with patient-centered care in mind. We have developed a team that offers an advanced level of expertise unique among the area's community-based institutions. At both Sinai and Northwest hospitals, patients and their families find something rare -- an institution large enough to offer leading-edge care, yet small enough to touch individual lives.